Ok sports fans, in case you’ve been living under a rock, you are well aware of the tumultuous offseason that Johnny Manziel has endured. The reigning Heisman winner’s offseason antics have caused more drama than a Miley Cyrus VMA performance. (Well at least he wasn’t twerking). Most recently, the Texas A&M quarterback allegedly collected large sums of cash in return for thousands of autographs. Subsequently, the NCAA reprimanded Manziel by having him miss the first half of the first game of the season. Amid these controversies, this continues the everlasting debate of whether NCAA athletes should be paid. I believe that NCAA athletes should be paid for their services. First things first, the NCAA is a business just like the NBA, NFL, MLB, etc. To be exact, a $871.6 million business in 2011-2012 (according to ncaa.org). But out of the $871.6 million, NCAA athletes are not compensated a single dime of it (excluding scholarships). Colleges and stores can sell merchandise with your name, image, or likeness on it, but you are not entitled to receive anything. Michigan’s Fab 5 were the first to scrutinize this problem on a national stage; 20+ years later, it is safe to say that nothing has changed. A typical Division 1 NCAA athlete has a rigorous schedule between school and the demands of their sport. They have numerous practices a day, conditioning, workouts, video sessions, meetings, etc. Essentially, they have the schedule of a professional athlete while being a full-time student. As a football player, your schedule can be even more demanding. I know the NCAA puts the emphasis on STUDENT/athlete, but sometimes it appears as if it should be ATHLETE/student. Many Division 1 Colleges in the NCAA make millions of dollars in profit each year. In a study done by espn.com, Penn St., Michigan, and Texas A&M profited $12.3 million, $13.5 million, and $15 million, respectively in 2008. I understand that not every college is going to turn in profit on their athletic programs, but what about those that do? Out of the millions of dollars profited, how much are the athletes getting paid? $0. I am completely aware that some of these athletes receive full-ride scholarships that can equate to over $100,000 for four years. But, for me, that still isn’t fair. These athletes step out on the field (or court) everyday sacrificing their bodies, health, wellness and careers only to receive nothing. What if you have a career ending injury and immediately lose your scholarship? The NCAA expects these players to sacrifice everything in order to bring in money for their institutions, but yet they are not compensating them in return. Is there a way for the NCAA to agree to compensate athletes? I realize that this is an extremely complex question, that requires an even more complex solution. I may not have a solution, but I do have some ideas. Maybe a player can receive a percentage of all merchandise sold (jerseys, t-shirts, key chains, etc) that is specific to them; meaning that their name is on it. Therefore it’s not a general amount you’re giving to all players, but only those select players that are specifically bringing in the revenue. Or maybe consider the idea of college athletes accepting endorsement deals. As crazy as some of these ideas sound, inevitably the NCAA will have to consider monetary options for athletes. One way or another something has to be done. Otherwise we will continue to see people like Reggie Bush, Manziel, and other athletes violate NCAA rules, and accept illegal benefits. Too many institutions have compromised their integrity. To put things in perspective, 53 of the 120 universities in the NCAA’s top competitive level, the Football Bowl Subdivision, were found by the NCAA’s Division I Committee on Infractions to have committed major rules violations from 2001 to 2011 (according to insidehigher.com). The most common infraction listed was impermissible benefits. Coincendetal? I think not. I understand that college athletes know what they are getting themselves into. They are fully aware that they will receive no compensation while participating in their respective sport. As a NCAA athlete, it is your job to abide by the rules. When you signed up to play division 1 football, you agreed to be obedient and serve your school with dignity. Even though Texas A&M brought in millions of dollars on your behalf Mr. Manziel, you consented to the rules of the NCAA to receive nothing. Is it fair? NO. But do you have to respect the rules of the NCAA? Yes. Your future is at stake, and you don’t want to end up like some other disgraced athletes. Until something is done where the NCAA can work out a plan to compensate athletes, you have no choice but to cooperate. 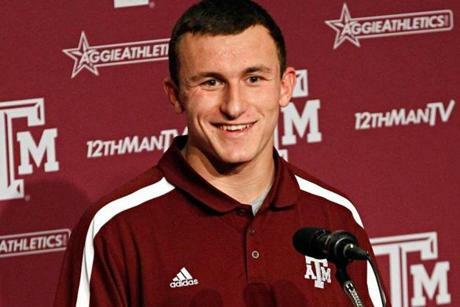 In the best interest of the NCAA and your future, Johnny be good. I agree with you position and enjoyed your insight.